Confession: my kids are the world’s pickiest eaters. I know you must think I am exaggerating, but I am not! Most nights I am making two, if not three different dinners. And it’s gotten out of hand. 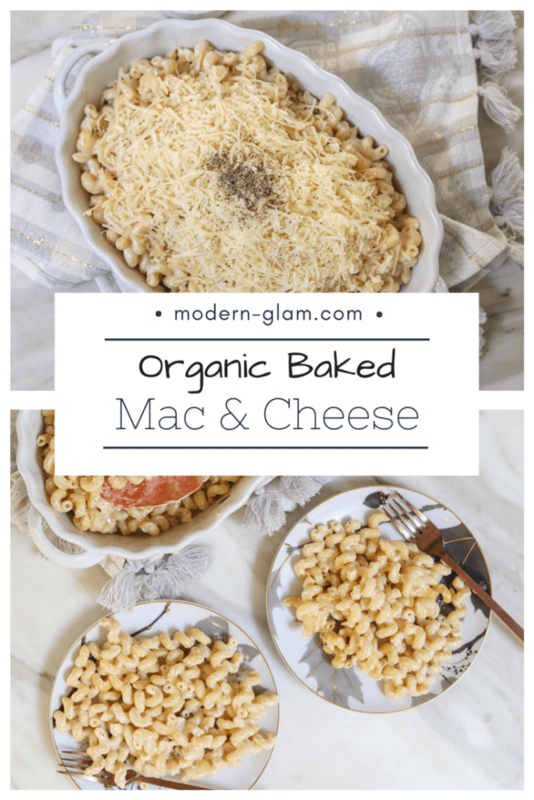 So in an attempt to make a meal that satisfies everyone’s palettes I have created this Organic Baked Macaroni and Cheese. As a kid I admit, I was a picky eater too! My favorite food was Mac & Cheese and I ate it religiously through my twenties! 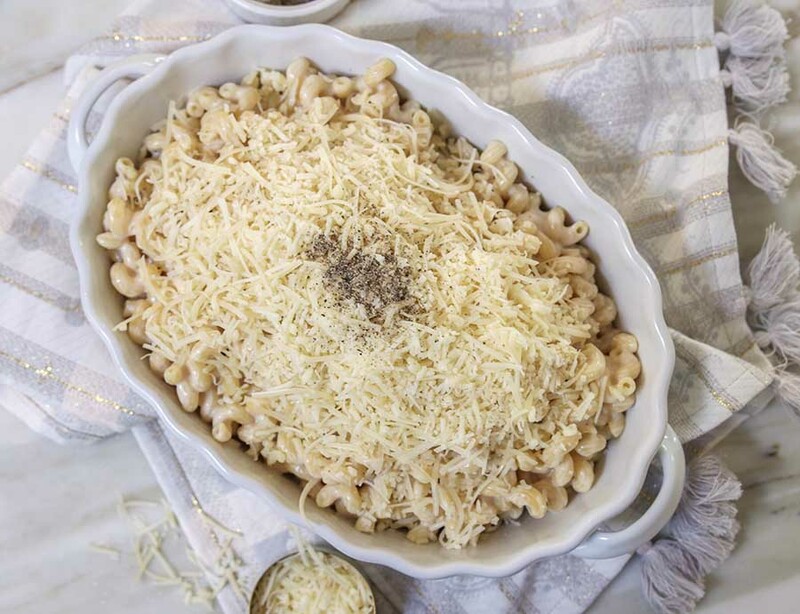 Nothing says comfort food more than this creamy and cheesy dish. So, I get it. I understand why this is my kids most requested meal. Now, I usually make them the boxed organic version. But my mom guilt creeps in when I am serving them powdered cheese rather than a healthier alternative! It’s so easy to get into a cooking rut. And it’s hard to find quick and healthy ideas that can satisfy everyone’s appetites. When I was shopping for groceries the other day and spotted the new Bertolli’s Organic Creamy Alfredo Sauce my wheels started spinning. I knew this was the perfect way to create a healthy and organic meal that the whole family could eat! The entire Bertolli Organic suite contains no artificial flavors, no artificial colors and no high fructose corn syrup. And that makes this mom feel better about creating this shortcut recipe using a product with such quality ingredients! 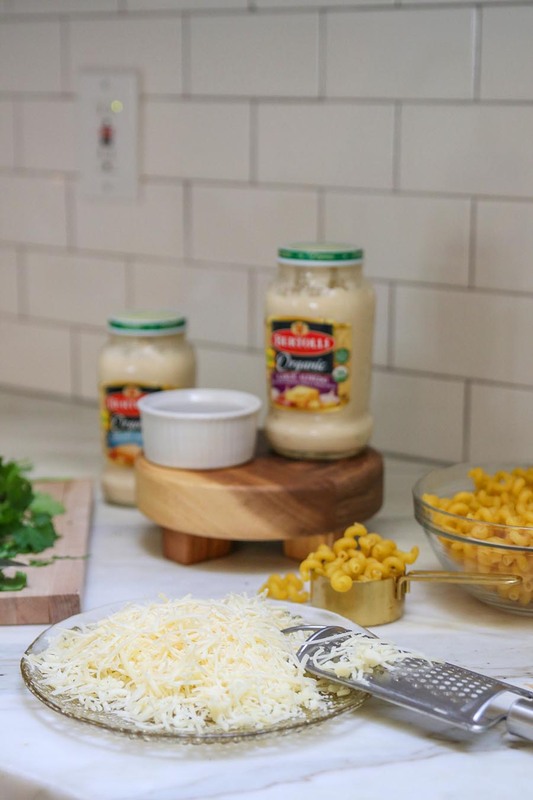 And these new white sauces are crafted with premium, USDA-certified organic ingredients, adding creamy white sauces to the Bertolli Organic lineup for the very first time. 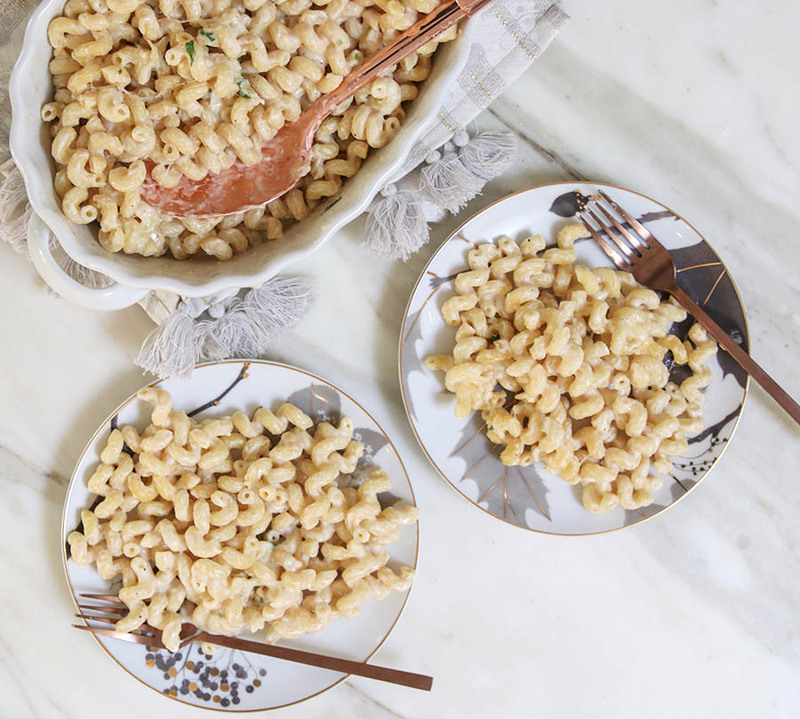 Made from all-organic ingredients including aged parmesan, fresh cream and savory garlic, the two new alfredo varieties are perfect for my Organic Baked Macaroni and Cheese recipe! To find out more about this new line of Bertolli pasta sauces visit their website here! This recipe is perfect for a weeknight meal because it’s quick and can be thrown together last minute. And I’m pleased to announce that my ENTIRE family loved it! Serve with a side of warm crusty bread or some roasted broccoli (if your kids will eat it, lol)! Bonus! Make this a one pot meal by cooking the pasta in an enamel dutch oven and skip transferring to the baking dish! This post was sponsored by Bertolli, but as always, all opinions are my own. A healthy and easy meal the whole family will love! 1 jar Bertolli Organic Creamy Alfredo Sauce 15 oz. Boil pasta according to directions until al dente. While the pasta boils, finely chop the parsley and shred the cheese. Once the pasta is cooked, drain and return to pot. 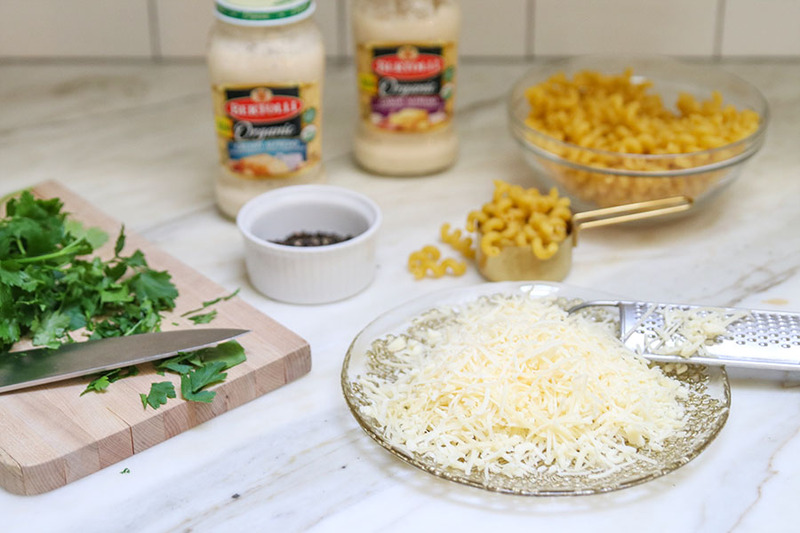 Add the jar of Bertolli Organic Alfredo Sauce. Heat on medium heat until warmed through, stirring frequently (approx 3-5 minutes). Transfer the pasta to an ovenproof baking dish. Note: skip this step if following directions for a one pot meal. Top with pepper and shredded cheese. Place dish in oven under broiler setting until cheese is golden brown and the edges begin to bubble (approx 7-10 minutes). Let cool slightly and garnish lightly with chopped parsley. To make this a one pot meal, simply cook the pasta (as stated in step 1) in an enamel dutch oven pot or other oven safe pot. Finish the recipe as directed skipping step 4.